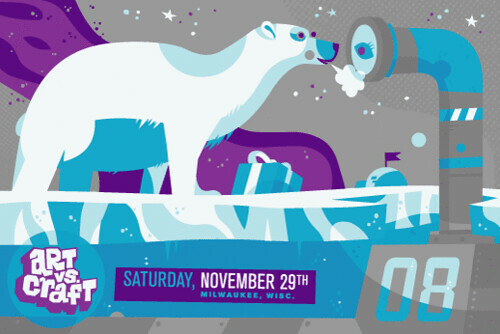 If you happen to find yourself in the city of Milwaukee, or thereabouts this Saturday, you should join in the the craft fair fun at Art vs. Craft this Saturday. The event will take place at the Humphrey Masonic Center, which is located at 790 N. Van Buren St. in downtown Milwaukee, Wisconsin. Here's a map to guide you there. Oh, and they will have the finest beer on tap, just in case you get a hankering to have one while you are in the Beer Capital of the World. 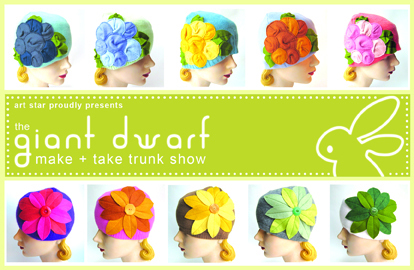 I'll be there selling tons of Giant Dwarf eco-friendly goods such as Cloche Hats, Glovettes, and Rosette Fascinator Headbands. I'll be sharing a table with my pal Jami from Built In Pittsburgh. She'll have lots cycling accessories, such as caps + winter hats. We will have lots of mirrors, so we'd love it if you stopped by to try on our stuff that we flew so far to show you! Artist + Crafter Sue Eggen, of Giant Dwarf, will be making her signature cloche hats from recycled materials. Choose from a collection of luxurious sweaters, colorful wool felt, and beautiful vintage buttons to customize your very own one-of-a-kind creation. These gorgeous cloche hats will keep your crown warm and fancy as the leaves begin to change and the snow suddenly starts to fall. The trunk show will take place in the annex of Art Star Gallery + Boutique. During the event save 10% off all Art Star Boutique purchases. Students save 15% with student ID. Also enjoy live music + tasty snacks from Swallow Bistro while you shop handmade for the holidays! For more information about the trunk show, please visit the Art Star event page. I hope to see all of you there!